Pigeons are the most common bird species throughout our towns and cities, however, unbeknownst to many this nuisance bird can actually cause major damage to residential and commercial properties. Pigeon fouling can cause an unsightly mess on premises of all sizes and these droppings harbor other infestations further extending your pest problem. These secondary infestations pose a serious health risk and if left untreated bacteria and fungus can result in respiratory and intestinal problems as well as the spreading of diseases such as Escherichia Coli (commonly referred to as E coli) and Salmonella. In addition to this, pigeons have been known to attack people during the breeding season, which runs from March to September, in a bid to protect their young. Whilst it is illegal to use pesticides on any bird species within the UK, the fully qualified and equipped technicians here at Europest utilize industry approved pigeon control methods to successfully control feral birds on your premises in a non-toxic and humane manner. Our specialist pigeon removal team uses a range of deterrents to manage your problem discreetly and professionally. Using pigeon control ensures the most appropriate methods are employed to resolve your problem and our British Pest Control Association accredited pigeon removal experts carry out bird netting, install pigeon spikes, apply natural deterrents and manage electrical and wire deterrent systems to deliver a complete, budget-conscious solution. As well as catering to residential properties throughout the south west of England, Europest also provide an all-round pigeon removal service for businesses from various industries. 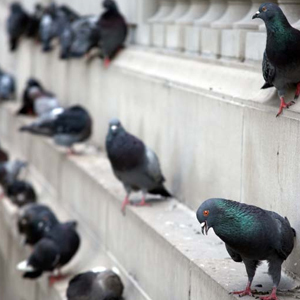 Our qualified team has experience working with clients in the food, engineering, education and public sectors, and use their knowledge to identify and deter problem pigeons on affected commercial premises. We know just how important it is to retain your business’ reputation and a pigeon infestation can quickly cause numerous issues throughout your corporate property. Pollution caused by fouling and noise can affect your business’ appearance and atmosphere, whilst maintenance costs can quickly spiral out of control due to damage caused by nesting and additional cleaning services needed to remove bird droppings. The pigeon control specialists at Europest provide comprehensive business site surveys and effectively use the information gathered to bestow expert advice and source a pigeon removal solution that fits. If you have a domestic or commercial pigeon problem, our pigeon removal team can help. Contact us today on 02920 868961 to discuss your pigeon control requirements.